Although you may not notice the temperature change when it comes to going from the pool to the changing room or even the lowered temperature within the public pool - your baby will most likely notice this change. 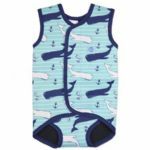 Babies are not yet adept at regulating and controlling their body temperature and for this reason many parents choose a baby wetsuit that can be used to ensure the baby remains warm while swimming. Baby wet suits are not out of place at the local indoor pool to ensure that the child is able to remain warm, but they can also be seen through many outdoor pools as the fabric that has been used to create these wet suits is often tightly woc3en to provide a high level of UV protection and ensure that the child remains protected through the course of the swim. 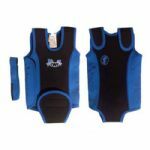 There are many styles of wet suits that can be chosen from and some styles even have embedded floatation device to ensure that the child remains afloat while they are taking advantage of the wetsuit. 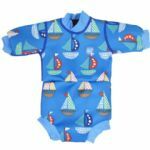 Other styles include protection through the head to ensure that the child is able to remain afloat and many styles include features like zippers through the entire suit to ensure that the parent is able to easily dress and remove the baby wet suit from the squirming baby! Once you have decided which features are important to you through the wet suit you can begin the shopping process. 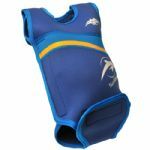 Searching through local sporting goods stores, as well as searching through online stores can be an effective way to ensure that the parent able to shop for the styles that you would like from leading brands, to ensure that the child not only remains safe while in the water, but also remains warm.